What does this mean? What is at stake? And, in terms of what I am most interested in, what does this mean for the schlemiel? More importantly “who” is in the crib? Is the schlemiel in the crib or is it, rather, the Christian fool? And how does “he” (whoever he is) relate to the “crib as historical gesture”? To answer these questions, I need to unpack the essay so as to follow Agamben’s logic and rhetorical tactics. I will begin this task here and carry it out over a few entries. For what it shows us is the world of fable at the moment when it wakes from enchantment to enter history. The creature of the fable is subjected to the trials of initiation and the silence of the mystery, but without experiencing them – in other words, by undergoing them as a spell. But wouldn’t “enchantment” also be a deprivation of speech? Anticipating this question, but not openly stating it, Agamben argues that this is enchantment “must be shattered and overcome.” I find this moment fascinating since, as I pointed out in my last blog entry, Agamben’s “gag” risks enchantment itself. After all, a gag is something you put in a mouth to keep one from speaking. 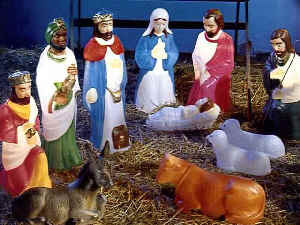 In the next entry, we will take a closer look at the creature and its relationship to the crib and the nativity scene. And within this scence-slash-historical-crib-gesture, we will find Waldo (I mean the fool who may not be a Christian fool).